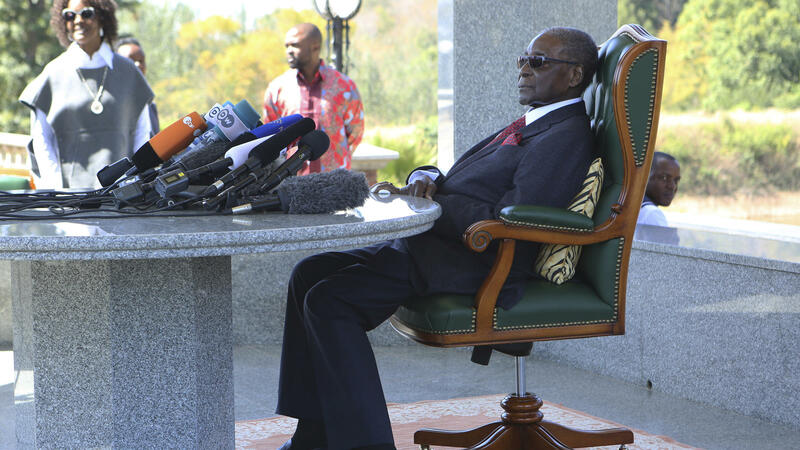 Former Zimbabwean President Robert Mugabe holds a press briefing at his residence on Sunday, on the eve of the country's elections. But the day before elections — the first time he is not on the ballot since Zimbabwe's independence in 1980 — the notoriously long-winded Mugabe was not about to stay silent. "I cannot vote for those who have tormented me," he said at a press conference. "I can't." Mugabe then strongly hinted that he would support Nelson Chamisa, the young lawyer, pastor and leader of the opposition Movement for Democratic Change. It was a remarkable act of political vengeance. Last year, Mugabe was ousted by his former vice president and enforcer, Emmerson Mnangagwa. Under Mugabe, Mnangagwa was exiled from government, but he regrouped abroad and persuaded the head of the army, Constantino Chiwenga, to join him in forcing Mugabe out of power. In November, tanks rolled through the streets of the capital city. Troops surrounded Mugabe's home, and for the first time in decades, the military allowed Zimbabweans to march on the streets en masse to call for Mugabe's resignation. Feeling cornered, Mugabe stepped down. Mnangagwa took over the presidency and Chiwenga became his vice president. On Sunday, Mugabe spoke for nearly two hours. He was at times bitter, recalcitrant and still eaten up by the betrayal. He said he hoped Monday's election would "bring a better day." And without a hint of irony, the man who led a regime that squashed dissent violently for decades said he yearned for the days of freedom in Zimbabwe. He said that since he was ousted, his friends and allies no longer feel free to express their support of him. "What have we become in the country?" he said. "Have we become savages, terrorists to ourselves?" Despite his ouster, Mugabe remains a powerful figure in Zimbabwe. He still has a base. Mnangagwa blamed Mugabe loyalists for a grenade attack at one of his rallies earlier this month. So his speech was being carefully monitored, and officials in Mugabe's former party, Zanu-PF, responded swiftly. Nick Mangwana, who is part of the Zanu-PF communications team, wrote on Twitter that the party had been made "aware of the rumblings of a retired old man." "He is a pensioner and we will continue to respect him in that regard as cultured Africans regardless of the fact he no longer merits it," he wrote. "He has 1 Vote like all of us and his vote choice is respected." Later in the evening, Mnangagwa tried to turn the tables. He recorded a video message, saying Mugabe's statement made it clear that he was now part of an alliance with the opposition. "The choice is clear, you either vote for Mugabe under the guise of Chamisa or you vote for a new Zimbabwe under my leadership and Zanu-PF," he said. Mugabe, for his part, defended his record. He implied that he had always won his elections fair and square and that he had remained in power without the help of the military. Over the years, however, human rights groups have documented systemic voter intimidation and rigging. After the 2008 elections, for example, tens of thousands of people were displaced as the government unleashed violence against MDC supporters. "Let's pray that tomorrow brings us good news," he said. "And I believe the good news to everyone is we get our freedom back, that we get democracy back." The most credible poll has Mnangagwa and Chamisa in a dead heat. Today is election day in Zimbabwe. These are the first elections there since President Robert Mugabe was forced out last year. Mugabe was in power for 37 years until November, when he was replaced by a longtime deputy. Now, voters in the country say they are energized, but Zimbabwe does have a long history of election violence and ballot stuffing. NPR's Eyder Peralta is in Zimbabwe. Good morning, Eyder. EYDER PERALTA, BYLINE: Good morning, Noel. KING: All right, so this is a very big day there. Thirty-seven years under Mugabe - no longer. Who are the big contenders, the main contenders to replace him? PERALTA: So there are 23 candidates. PERALTA: And, you know, this is historic not just because Mugabe is not on the ballot but also because Morgan Tsvangirai, who is the historic - has been the historic opposition leader - he died. And he's not on the ballot either. So there's two men who really have the best shot at this thing - Emmerson Mnangagwa, who you mentioned, and he ousted Robert Mugabe. And he is running against a young upstart. He's a pastor. He's an attorney. He's a good talker. And his name is Nelson Chamisa. And what's interesting is both of these candidates are running on a platform of change. They're saying that they will both bring a new Zimbabwe. And another interesting thing is that we got a kind of curve ball yesterday from the former leader of Zimbabwe, Robert Mugabe. He called all of us into his mansion yesterday. And he announced that he is supporting the opposition. It was truly just a remarkable act of political vengeance. You know, Mugabe still has pull in this country, so that may mean something at the end of the day. KING: Not supporting his longtime deputy man. All right, so you say both these guys are running on a platform of change, which is one of those squishy political words. When voters say change and hear change, what do they think? What do they want? PERALTA: Here it's really simple actually. It's the economy. You know, there's a lack of money here in Zimbabwe. There's a huge lack of jobs. And, you know, what I've been hearing from Zimbabweans is that they want a better life. They want - you know, they want to have a job. They want to be able to send their kids to school. But they're also focused on whether these will be truly free and fair elections. Lots has changed since November when Mugabe was ousted. But people still have questions. Today I was in rural eastern Zimbabwe. And I spoke to Esther (ph), who only gave me her first name because she was afraid. And she said when she got to the polls at 5 a.m., there were people taking her names. The police stopped it. But let's listen to a bit of our conversation. I mean, that makes you brave to be here today. ESTHER: Yes. Yes. (Foreign language spoken). PERALTA: And what she's saying is they want to be brave. They want to show up. They want to withstand the intimidation because they want change. KING: But again, you hinted or alluded to the fact that this woman seemed to feel as if she was being threatened. People tried to take her name until the police intervened. I wonder, are there concerns given Zimbabwe's history that whomever loses this election will not accept the results? PERALTA: Yeah. I mean, you know, Nelson Chamisa has said as much. He, you know, gave a wide-ranging press conference in which he said the only result he will accept is a win by him. PERALTA: Mnangagwa has actually said he will accept defeat. But he says he's also confident that he will win. So yes, there are lots of concerns, not just about what happens today but what happens as voting begins here - as counting begins. KING: NPR's Eyder Peralta. Thanks, Eyder. PERALTA: Thanks, Noel. Transcript provided by NPR, Copyright NPR.